This division is in line with Solidium’s long-term programme for responsible ownership 2013–2016. During the past financial year, Solidium carried out continuous corporate responsibility work in the portfolio companies. There were few corporate responsibility issues that required owner’s input in the companies, just as in the previous financial year. Solidium’s main project in corporate responsibility work was the implementation of the new analysis tool. An annual analysis is conducted on each company owned by Solidium, and the resulting conclusions are used in the dialogue with the management of each company. The structure of the new tool, the responsibility analysis, is based on themes. It focuses on the corporate responsibility themes which have been deemed the most important in terms of enhancing and securing shareholder value in the company in question. There are fifteen themes in total. The themes have been built on the GRI (4.0) reporting framework by grouping the 46 aspects of the GRI into more extensive themes in accordance with the owner’s perspective. 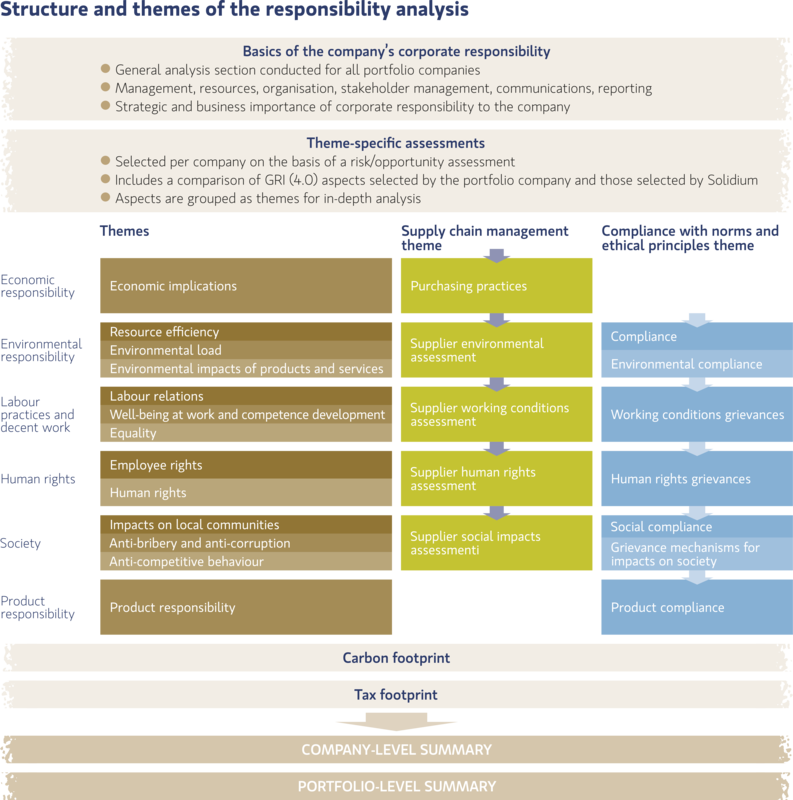 In the first stage of the analysis, the investment teams apply the GRI framework to evaluate the corporate responsibility aspects that are the most material for the owner. This involves assessing the potential impact of each aspect on shareholder value as a business risk or opportunity. The aspects selected by the investment teams are compared to the aspects designated by the portfolio company in its own materiality analysis. This comparison is possible, since nearly all companies owned by Solidium already apply the GRI (4.0) framework in their reporting. How material is the theme in terms of shareholder value? What kinds of risks or opportunities are associated with the theme? How significant are they for the company’s business operations? Have any risks or opportunities related to the theme been realised in the company’s operations? What business impacts have arisen? What is the maximum impact of the theme on growing or securing shareholder value? Is the impact critical in terms of shareholder value? Does the company sufficiently manage the risks or opportunities related to the theme, according to Solidium’s assessment? What measures has the company taken to enhance or secure shareholder value? What is the development of the risks or opportunities related to the theme? Which factors, including changes in the external operating environment, impact the development? What is Solidium’s view of the risk level or potential opportunities related to the theme? Does the theme involve any specific action by Solidium as an owner? If so, what action should Solidium take in its duty as an owner? Themes and aspects are selected based on an analysis of their impacts on shareholder value. The impacts on shareholder value may be direct or indirect. A direct impact may reflect on the development of the company’s share price. It may also become apparent in other ways. For example, it may increase or decrease revenue or profitability, change the company’s financial position, or affect the achievement of financial targets over the long term. By contrast, an indirect impact may realise in the company’s reputation. The themes are the investment team’s view of the key risks or opportunities related to corporate responsibility. They have been selected from the perspective of growing or securing shareholder value. The selection of themes does not constitute a value-based statement nor does it indicate Solidium’s opinion on the importance of the different corporate responsibility aspects. It should also be noted that the responsibility analysis does not emphasise financial factors. The assessment of the financial performance of the portfolio companies is carried out with other methods. Growing financial value in the long term is the core of Solidium’s work, and each portfolio company is financially responsible towards its owners. The “Economic impacts” theme in the responsibility analysis summarises the three economic aspects of GRI (4.0) reporting, and it is primarily applied to situations where a company’s capability to bear economic responsibility has been deemed insufficient. In addition to the theme section, the responsibility analysis includes a general section, which is conducted for all portfolio companies. It focuses on analysing the strategic and business importance of corporate responsibility. Each responsibility analysis also includes a tax footprint section, which focuses on tax payment reporting and management policies in each portfolio company. In addition, a carbon footprint analysis was carried out for all Solidium’s portfolio holdings. Supply chain management as a factor impacting shareholder value is emphasised in Solidium’s portfolio. Subcontracting is increasingly important in both the manufacturing industry and information-intensive companies. Sustainability in subcontracting is still a fairly new topic, and it will take time for companies to develop their operations. Solidium estimates that nearly all companies included in the theme still have room for improvement in the management of responsibility in their supply chains. In Solidium’s holdings, the risk level related to managing supply chains is expected to remain unchanged or, in some cases, to increase. “Anti-bribery and anti-corruption” is a responsibility theme that is equally important in Solidium’s holdings. Many of the companies we own operate in the emerging markets or other countries with an elevated risk level. However, as a result of analysis, risk management is considered to be sufficient in the companies. Product responsibility is an important theme of corporate responsibility in more than half of the portfolio companies, and it applies to both manufacturing and information Solidium 17 industries. Data and privacy protection are emphasised. Level of management concerning this theme varies across the portfolio companies. In nearly half of the portfolio companies, the “Environmental impacts of products and services” is a potential source of growing shareholder value. The portfolio contains several examples of solutions which both mitigate environmental impacts and enhance shareholder value. The “Well-being at work and competence development” theme covers two different groups: on one hand, companies in which occupational safety improvements are needed and, on the other hand, companies in which competence development is an important enabler of growth. “Resource efficiency” is an important responsibility theme that drives value in energy-intensive manufacturing operations. Environmental load is highlighted primarily in the heaviest process industry. The investment teams have found the new responsibility analysis beneficial, since it provides an opportunity to focus on themes which are material for each company. The method also offers a systematic comparison between aspects selected by the company, on one hand, and those emphasised by the owner, on the other. In future, internal dialogue within Solidium will be important in order to strengthen the harmonisation of the operating model and interpretations. Attention should also be paid to the consistency of company-specific themes in all portfolio companies. Our new tool continues to be a qualitative method of analysing corporate responsibility. Ideally, it should also be possible to carry out quantitative assessments of the financial impacts of corporate responsibility matters which are material for the owner. However, this would place additional requirements on the information provided by the companies. Therefore, we hope the companies would develop their responsibility reporting also from this basis. During the financial year, we investigated possibilities to obtain our portfolio companies’ peers corporate responsibility data which could be included in our new analysis. The goal is to increase the numeric comparability of the information. During the financial year, we examined data that corporate responsibility “rating experts” could provide. We also developed a more extensive method for assessing the carbon footprint of Solidium’s portfolio. We also studied the climate policies of other investors. The Business Case of Sustainability project was completed. In the project, a thesis was conducted to review methods of assessing the financial impacts of corporate responsibility measures at the individual company level. It also highlighted some examples of companies providing information on the economic impacts of their responsibility work. Solidium’s stakeholder engagement continued in the established manner during the financial year. The focus was on dialogue with the portfolio companies and the owner, as well as with internal stakeholders. In addition to an annual responsibility analysis, the dialogue with portfolio companies includes monitoring portfolio companies’ continuous corporate responsibility work. Internal stakeholder engagement was characterised by the implementation of the new responsibility analysis and preparation of the next long-term programme for Solidium’s responsible ownership. A more extensive round of external dialogue and update of stakeholder feedback planned for the financial year were postponed to the following period. We continued to participate in the development of sustainable investment in Finland. For example, Solidium’s Investment Director was a Board member and vice chairman of FINSIF. Solidium was also a member in FIBS and Directors’ Institute of Finland. We participated in events concerning corporate responsibility and sustainable investment. Direct activity from civic organisations and NGO’s towards Solidium was not high in the financial year, similar to the previous period. Solidium’s Board of Directors discussed corporate responsibility matters twice during the financial year: through the portfolio companies’ materiality analyses at the beginning of the financial year and the annual review of the responsible ownership at the end of the period. During the financial year, we continued our integrated operating method, in which our responsibility analyses are conducted by our investment professionals themselves. This requires that our entire personnel are well-versed in corporate responsibility and update their competence regularly. Human rights awareness was strengthened among personnel through a lecture series on human rights. The lectures were tailored to Solidium’s needs as an owner. New Solidium employees received induction in the aspects and operating methods of responsible ownership. We launched an update of our long-term programme on corporate responsibility. The programme provides a framework for our responsibility work. It supports Solidium’s mission to grow the financial value of its holdings over the long term and also strengthens Solidium’s operating model of responsible ownership. Sustainability themes currently emphasised by the other Finnish and Nordic owners and investors were assessed as a background for the renewed programme during the financial year. In addition, the ownership policies of other long-term owners were compared from the perspective of corporate responsibility. The responsibility focus in our own operations is on responsible personnel practices. Solidium is an expert organisation whose most valuable asset is the competent and motivated personnel.